Love it or hate it, our modern connected entertainment systems are more dependent than ever on good Wi-Fi, and this trend only looks to continue upward going forward. Whether you're using your mobile device to streatm Netflix or just to control your multiroom music system, there's nothing worse than stuttering, buffering, or simply knowing that your internet pipeline is giving you more than what you're getting from your wireless connectivity. Samsung's latest solution to those dreaded problems is an updated SmartThings Wi-Fi platform that relies on AI-based mesh technology from Plume. The new system comes in single-router solutions or a handy three-pack, and the beauty of it is that the networking system also serves double duty as a SmartThings home control and automation hub. It won't operate your home theater, mind you--not without the addition of a Harmony remote and hub--but everything else from locks to lights to motion sensors and more is covered. 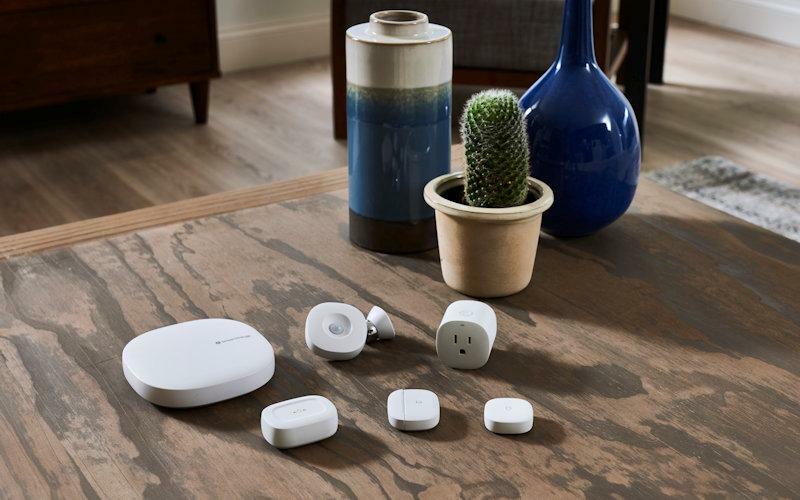 In an effort to eliminate dreaded Wi-Fi buffering and prevent streaming latency, Samsung Electronics America, Inc. today announced its new SmartThings Wifi mesh network system. Equipped with AI-based mesh Wi-Fi technology from Plume and a built-in SmartThings Hub, the system delivers an intelligently optimized whole home network with the added value of complete smart home control throughout every room of the home. "As more people embrace a connected lifestyle, we're focused on creating the best experiences so they can get more out of their smart home," said SK Kim, Senior Director, IoT Product Marketing at Samsung Electronics America. "SmartThings Wifi is an intelligent solution that adapts to the many devices in the home, with mesh capability to eliminate coverage gaps plus a built-in SmartThings Hub to easily monitor and control hundreds of compatible smart products." Samsung partnered with Plume to integrate its AI-based mesh Wi-Fi optimization into SmartThings Wifi. The Plume platform adapts to internet usage in the home and intelligently allocates bandwidth, mitigates interference, and delivers maximum Wi-Fi capacity across the home, accounting for every connected device and selecting the optimal band and frequency channel so users can get the fastest speed possible. Plume's technology can optimize a home network across multiple devices so parents working from laptops can download files while kids stream TV, and gamers experience speed and reliability even when others are on the network. Now, Wi-Fi goes where the need is instead of the other way around. Users can also set parental controls to manage screen time and set-up special logins and passwords for guests using the Plume HomePass® feature. "Integrating our adaptive home Wi-Fi technology and a rich set of consumer features into SmartThings' large, open ecosystem truly elevates the smart home experience," said Fahri Diner, co-founder and CEO, Plume. "Samsung gives you myriad devices to consume content and connect, and Plume ensures that your Wi-Fi network delivers a superior user experience to all of those devices." SmartThings Wifi works as a SmartThings Hub to serve as the "brain" of the smart home. Samsung's open SmartThings ecosystem makes it easy to automate and manage the smart home with one hub and the SmartThings app. Compatible with hundreds of third-party devices and services, SmartThings enables users to expand their smart home with lights, door locks, cameras, voice assistants, thermostats and more. SmartThings Wifi delivers a simple, convenient 2-in-1 solution, offering whole-home automation out of the box. The SmartThings Motion Sensor is additionally redesigned with a magnetic ball mount, so consumers can adjust the tilt angle for a wider view range to detect motion and trigger automated events. Samsung is also introducing the new SmartThings Button with programmable triggers that manually control routines around the home - like setting Movie Mode - without having to go into the SmartThings app. The SmartThings Button, like the rest of the SmartThings sensor line, monitors temperature in an area of the home, such as basement or baby's room, and signals the smart thermostat to adjust automatically. For more information about Samsung Smart Home, visit www.samsung.com/us/smart-home. • Shopping for Smart Home Products? Here's What to Expect. at HomeTheaterReview.com. • Samsung Releases Bixby-Equipped Sequel to "The Frame" at HomeTheaterReview.com. • Getting Started With Basic Home Automation: Control4 Edition at HomeTheaterReview.com.